What is a lifestyle business? Why do prospects invest in hiring an agency? Spotlight on Jonathan Bernstein of Bernstein Crisis ManagementJonathan Bernstein is a leading authority on crisis management and has great insights as a long-time communicator and agency owner. Spotlight on Kevin Anselmo of Experiential CommunicationsKevin Anselmo, founder of Experiential Communications, has taken his passion as an entrepreneur and experience in education to launch the Global Innovators Academy training program for high school and college students. Spotlight on Kathryn Mason of MASONRYIt seems appropriate to feature an Irish agency owner as the St. Patrick's Day weekend wraps up. #FollowFriday: Shel HoltzFor all that does to help promote excellence in communications and improve the knowledge of agency leaders, Shel Holtz is this week's #FollowFriday recommendation. #FollowFriday: Scott MontyFor all that he does to contribute to the knowledge and understanding of PR, marketing, and technology, Scott Monty is this week’s #FollowFriday recommendation. #FollowFriday: Gini DietrichHow could I recommend resources for agency leaders without promoting my podcast co-host Gini Dietrich? She offers tons of smart advice for communications pros. ALP 26: How to avoid becoming an agency of oneMost agencies begin as one-person shows. But to grow and expand -- and keep the owner sane -- it can't stay that way forever. That's the challenge that Chip Griffin and Gini Dietrich tackle in this week's episode of the Agency Leadership Podcast. ALP 25: Unlimited PTO policies for agenciesChip and Gini discuss whether unlimited vacation policies are a good or bad idea for PR and marketing agencies. They each share their own experiences and explore the pros and cons. ALP 24: 7 Key skills for agency owners to develop (Part 2 Of 2)In the second part of a special two episode series, Chip and Gini discuss fundamental skills that PR and marketing agency owners should spend time and effort to improve to be more successful. CWC 28: Brent Lightner of Taoti CreativeBrent Lightner, founder and CEO of Taoti Creative in Washington, DC talks about his journey from pre-med student to successful marketing agency owner. CWC 27: James Papiano on leadership & culture in agenciesIn the latest episode of Chats with Chip, James Papiano discusses the role of leadership and culture in the PR and marketing agency environment. CWC 26: Nick Petroski of Promethean ResearchNick Petroski of Promethean Research joined to talk about the outlook for digital marketing agencies in 2019 and beyond. Do I need a business plan?In this episode of Agency Leadership TV, Chip Griffin discusses why there is more value in the thought process that goes in to crafting a business plan than in the document itself. 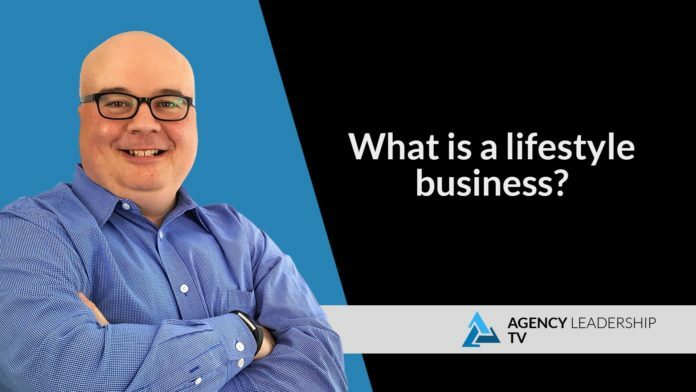 What is a lifestyle business?In this episode of Agency Leadership TV, Chip Griffin explains what a "lifestyle business" is -- and why you shouldn't think of it as a derogatory term. Agency Leadership Advisors helps owners and executives build better businesses. Discover how we can help. Want to talk? Contact us. In this episode of Agency Leadership TV, Chip Griffin explains what a “lifestyle business” is — and why you shouldn’t think of it as a derogatory term. At the same time, it should help you think about what you want to achieve with your own agency so you can make smarter business decisions yourself. This is an automated transcript. Please listen to the audio to verify accuracy. When I first heard the term lifestyle business, I was frankly a bit insulted. It was a conversation I was having with a business consultant that I was interviewing about 15 years ago and what he was trying to get at was, was I building a business that I was looking to exit or was it a business that I was building simply to sustain my own lifestyle? Now in my own mind, I was building something that I could exit with, but I understood as I walked through the conversation with him that I was consistently making decisions like taking out profits and things like that, but suggested perhaps it was really more focused on supporting the lifestyle that I’d become accustomed to. Now that’s important to understand when you’re building your own business, whether it’s an agency or anything else, you need to know what it is that you’re trying to achieve, and so frankly, at some level, every business is a lifestyle business. It’s just a question of what your goals and objectives are. So when you’re talking about a lifestyle business, when someone typically uses that term, what they’re suggesting is that you’re trying to. You’re putting an almost an artificial cap on your business. You’re saying, look, I only want to work a certain number of hours a week or certain hours in the day, or I value my flexibility of scheduling over, uh, you know, a growth or perhaps it’s more about putting profits into my own pocket, then reinvesting in future growth, but with less money in my own pocket today. There’s a lot of different things that you can be talking about when you’re talking about a lifestyle business, but ultimately what I would suggest is that every agency owner needs to understand what it is that they are trying to achieve and think about that in terms of the next six to 12 months, but also think about it over the next three or five years. What is it that you want to do? Do you want to have a large team? Do you want to grow as fast as you can and sell to someone else? Or are you content to have a network of freelancers that simply helps you sustain the trips and vacations that you want to take? That it helps put your kids through college? That helps give you the car and home that you want. What is it that you’re really trying to achieve, and if you understand that you’ll be able to make much smarter business decisions going forward. The Agency Leadership Hub provides news and insights for PR and marketing communications agency owners and executives. Sign up to get our latest articles delivered straight to your inbox. Agency Leadership Advisors helps PR & marketing agency owners build better businesses. We provide news, insights, and consulting to improve people, processes, and profit.